Sprint and HTC announce that the two companies are working together with Qualcomm to launch a “mobile smart hub” in the first half of next year. No further details were given about what exactly this smart hub looks like or what it do. But Sprint says it will “deliver multimedia and connected data capabilities in a compact and portable design.” It could be have a built-in projector, perhaps? 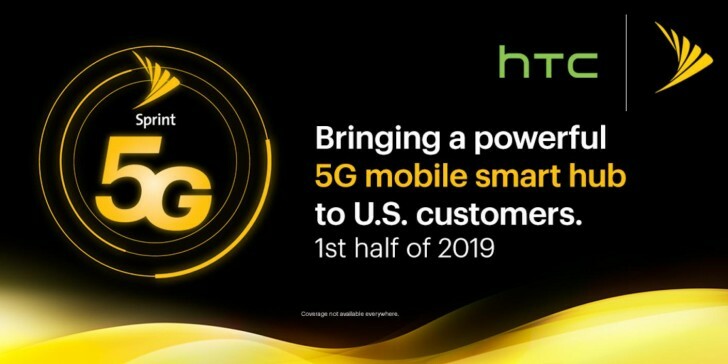 HTC is going to deliver the second 5G product meant for Sprint’s future 5G network. The first one is going to be a smartphone from LG which was announced for H1 of 2019 as well, back in August. It’s going to be the first official 5G smartphone – as long as you don’t count the Moto Z3’s 5G MotoMod. Sprint is going to rollout and launch its network over the first half of the year and the first markets to receive the rollout are Atlanta, Chicago, Dallas, Houston, Kansas City, Los Angeles, New York City, Phoenix, and Washington D.C. with more markets expected to be announced. It will be interesting to see how Sprint and T-Mobile’s 5G networks will combine once T-Mobile and Sprint merge into a single carrier. Back in April, CEO of T-Mobile, John Legere has said that he expects the merger to complete in Q2 of 2019.